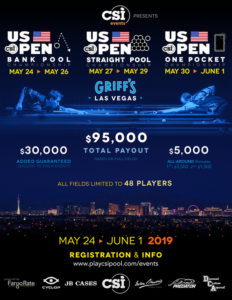 Need to add a One Pocket or Bank Pool event? Contact Us with the details! 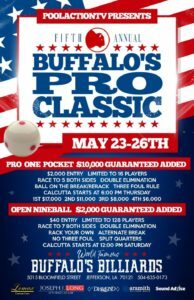 Buffalo’s Billiards, 5015 Bloomfield St.
Griff’s Bar & Billiards, 3650 South Decatur Blvd. - Field limited to 48 players - Top 16 seeded by FargoRate (round 1 bye) - ?$10,000 added guaranteed - Race to 3 / 4 - Stage 1: double elim. to final 16 - Stage 2: single elim. The official annual member's only tourney, details to follow!